"We stand at the brink of a second nuclear age. Not since the first atomic bombs were dropped on Hiroshima and Nagasaki has the world faced such perilous choices. North Korea’s recent test of a nuclear weapon, Iran’s nuclear ambitions, a renewed U.S. emphasis on the military utility of nuclear weapons, the failure to adequately secure nuclear materials, and the continued presence of some 26,000 nuclear weapons in the United States and Russia are symptomatic of a larger failure to solve the problems posed by the most destructive technology on Earth. This deteriorating state of global affairs leads the Board of Directors of the Bulletin of the Atomic Scientists--in consultation with a Board of Sponsors that includes 18 Nobel laureates--to move the minute hand of the “Doomsday Clock” from seven to five minutes to midnight." This all sounds pretty bad. Good thing I don't believe in "science". If I did, I would be crapping my pants right now. P.S. Nobel Prizes are completely overrated. 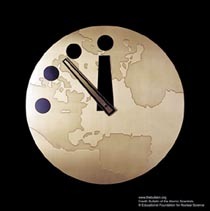 *Photo of Doomsday Clock courtesy of the Bulletin of the Atomic Scientists. aaagghhh. Five minutes. Just enough time for a quickie! Haven't they heard? Doomsday is already here. It's called 'the Bush Administration'. If we can survive this incarnation of Beelzebub, we can survive anything. Its funny. I was on this bus in the middle of nowhere Costa Rica, and I was talking with a guy from Quebec. He kept saying how not ALL Americans are as bad as people think and how people around the world don't realize that there are whole states that don't agree with the President and how they are taking the measures set forth in the the Kyoto Treaty anyway. He also pointed out how Global Warming is real and that if he were American, he would be a Democrat. Oh, another funny thing. One older man we met thought we were Swiss because we were really trying to speak the language and to be polite. Does this Smell Bad to You?